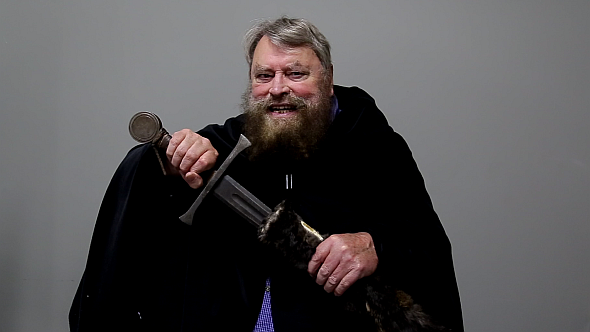 ﻿Update May 5, 2017: ﻿Warhorse Studios have released a video interview with the remarkable human being that is Brian Blessed. We learned last month that British actor Brian Blessed will be lending his megaton voice to Kingdom Come: Deliverance, the forthcoming historical RPG. The video accompanying the announcement (which you can view below) gave us a look at all of the talented cast, but if you were hoping for a little more of Blessed, today’s your lucky day. For more Medieval questing – perhaps with a dragon or two – seek ye out the best RPGs on PC. Developers Warhorse Studios have today released a video that focuses on Blessed and his character, Lord Konrad Kyeser, a German military engineer. He even treats the interviewer to a bit of opera, because, besides being an accomplished actor who has climbed Everest, earned a black belt in Judo and beaten up a polar bear, he’s also a trained opera singer. Original story April 6, 2017:Warhorse studios, the guys behind the historically-accurate medieval RPG Kingdom Come: Deliverance, have released a new video featuring interviews with the game’s cast. Among their number is the larger-than-life English character actor Brian Blessed, who explains what drew him to the project. Blessed’s character is Lord Konrad Kyeser, and because Kingdom Come: Deliverance distinguishes itself from other medieval-themed RPGs in its historical accuracy, he really existed. Kyeser was a German military engineer famed for writing Bellifortis, the leading book on his subject throuhgout the 15th century. Deliverance takes place in 15th century Bohemia during a succession crisis, with hopeful kings Wenceslaus and Sigismund each vying for the throne after the death of Charles IV. In real life, Kyeser’s loyalty to Wenceslaus saw him exiled to Bohemia during Sigismund’s reign, when the game begins. It’s not clear how much scope there will be for Blessed’s famous bombast in his new role – it’s hard to imagine there’s ever been anyone quite like him in actual history. If not, I’m sure it’ll be nice to see him to do some real acting, though I do hope there’s a nice easter egg around Kyeser’s accident-prone friend named Gordon. The game also features Matthew Wolf, who has appeared in The Order: 1886, The Royals, and Titanfall 2; Tom McKay, who has appeared in The Transporter TV show; and Luke Dale, who’s been in Holby City. Check out the video for thoughts from each, but if you’re waiting to see Blessed in a spandex mo-cap suit, you’ll be disappointed – he had a stand-in for that stuff, and is only doing voiceover. We also interviewed Kingdom Come: Deliverance’s cinematic director Martin Kleknerabout the game’s touted cutscenes. Kingdom Come: Deliverance is due for release sometime this year.